Congratulations to Pacific Ridge alumnus Jack Merrifield on helping the Division I Southern Methodist University Men's Lacrosse team earn its first-ever invitation to the Men's Collegiate Lacrosse Association National Championships. 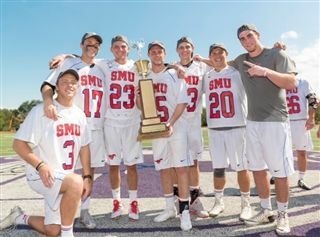 After going 16-0 during the season, the Mustangs defeated Texas State 6-0 in the Lone Star Alliance Tournament Championship on April 24th to qualify for the 19th annual MCLA. Jack, a junior midfielder, scored 19 goals this year, and received 2nd Team All-Conference Midfield Honors. The Mustangs will take on Cal Poly in the first round of the MCLA Championships on May 9th in Irvine, CA.